“Krypton” Episode 102 Recap: Duels and Meteors and Revenge Oh My! 3 Faced God, The Voice of Rao, sentenced Val-El to death and struck the House of El from it’s lists, taking away the remaining members rank in society and leaving them to live in the slums. Adam Strange gives Seg-El a Sunstone and instructs him to find his grandfathers Fortress of Solitude, and after he is almost caught out after curfew, Charys-El (his mother) steals a space car and takes him to the fortress. This leads to her arrest and eventual murder along side Ter-El, Seg’s father. Adam Strange then gifts Seg-El with Superman’s Cape, telling him that Brainiac is coming to destroy Krypton. Got it? Good! Now on to Episode 2 “House of El”. Our episode 2 opens on Seg-El and Adam Strange in the Fortress of Solitude where Seg questions Adam as to why Superman is not there to give him his cape (a legitimate question which I am sure we are a asking ourselves anyway). It turns out that Adam is a ‘Big Deal’ – code for Big Headed, and Seg does not, cannot, believe what Adam is saying and attempts to leave while refusing to help. Back in Kandor City, Adam tries to convince Seg to use Daron-Vex to his advantage and to use the telescopes to prove that Brainiac is coming to Krypton. Seg however – and rightfully so – wants revenge for his parents murders. Kandor Security try to arrest Seg, but he evades by hiding behind some crates. However his plan is not smart enough and is caught anyway. At least someone is finally smart enough to NOT fall for that trick! Now on to the Vex Household, where Seg makes an appearance all beaten up after his run in with the Law, and is brought before Nyssa (who is looking fine AF in her not so little black dress) who explains that Daron-Vex is waiting with Rao for them. Nyssa throws clothes at him and tells him to clean up as he will now bear the sigil of House Vex. They enter another room and we see the back of the Voice of Rao’s head and guess what, he has more than three faces and actually has 6! (and now I need to come up with a new name for him). Queue a large piece of exposition about Rao and how he saw wasted potential and formed the stars and the planets, the most perfect creation of course being Krypton. I mean Supergirl is from Krypton so they won’t find any arguments from me there. Seg seems to play along and is told that the following night, he will officially become a Vex. Now Lyta is left in the dark by mommy dearest about their new mission: to take blasters in to the slums and fire their way through until they find Black Zero. It turns out that ehr Commander – Quex-Ul – is completely against the rankless and does not care what happens to them, as long as they get Black Zero. Lyta’s husbands family, as it turns out, was killed by Black Zero and he was scarred in the process so he doesn’t care either, leaving Lyta in her one-woman crusade to save the rankless from slaughter. She brings it up with her mother and defends her lover Seg, as well as the rankless. Jayna-Zod however pulls rank and orders her to obey or else as she has been under performing lately. ‘Rankless Shitheads?’ OH NO YOU DIDN’T! Seg is back at the spot where it all began for his family – where his grandfather Val-El was killed and is joined by Lyta. Seg is a confused little boy and is lost now that his parents are gone Lyta tells him to ‘Be True to Yourself’. He goes to see Daron-Vex and asks for funeral rights to be granted for his parents – which were denied as his parents are seen as ‘Traitors’. Daron tells him he reminds him of Val, and tried to give him a history lesson telling Seg that they used to be close. Val developed a computer system and refused to reveal its location and detected Brainiac using it and no one believed him. Seg asks to continue Val-El’s work by serving in the science guild to work on his earlier work. Adam is now kitted out as a Kryptonian, but still refuses to ditch the Detroit hat. Seg turns up and he is starting to believe what Adam is saying about Brainiac. HE gives Adam two hours to find proof before he goes to kill Daron-Vex. 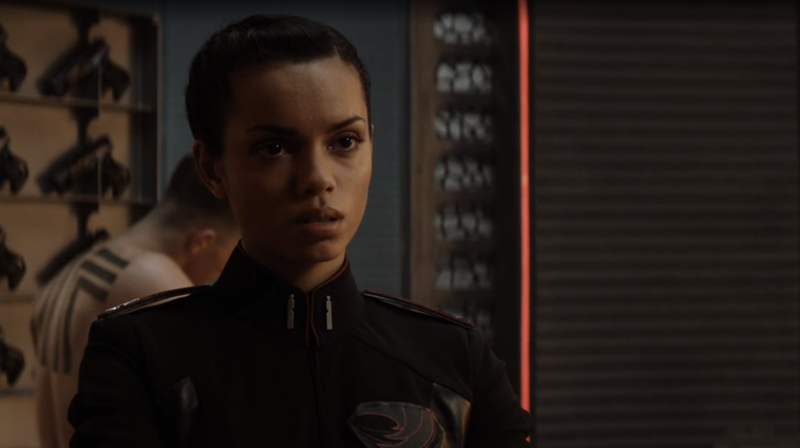 Lyta is in the locker room with her commander and invokes the ‘Spirit of Jo-Mon’ and challenges commander Quex-Ul to a duel to assume the role of commander of their branch of Security. Her mother hears and sass mouths her, telling her that she knows that she doesn’t believe that she will ever be a warrior. Lyta stands her ground and it looks like she will go ahead with it. Back at the bar, we are told by Kem – Seg’s friend- that there is a no big bad out to get them. Seg, hell bent on his revenge, makes up his mind to go and kill Daron-Vex, only to be stopped by Kem and Adam who ask for more time. Seg goes to see someone who can arm him and gets a tiny knife before heading to the Lawmakers Guild. Nyssa is waiting for him and she takes him to see his parents ashes in an urn bearing the sigil of the House of El. She gives them to Seg to perform funeral rites for them, temporarily halting his thirst for vengeance. It turns out that there was a meteor shower in the Outlands which Kem and Adam decide to illegally investigate, for the price of Adam’s watch and his beloved Detroit hat. Seg receives visitors who want to pay their respects to his parents, and the little one hands Seg a rock with the sigil of the House of El on it. This was where my heart exploded in to a thousand tiny little pieces. Now to Lyta who is preparing for her duel, and her husband tells her that she has always been a warrior and to go out and fight like one. At this point, I think my exact words were ‘YAAAAASSS QUEEN, GO FIGHT LIKE THE BADASS YOU ARE!’ Lyta turns out for the duel in a red cape and man oh man does she look good in red! She goes straight on the offensive, only to fail and be thrown around like a rag doll. In the fortress, Seg finds the computer after finding a inscription stating ‘The Blood of House El will forever bind us and slicing his hand over their sigil, turning it in to the red and yellow symbol we all love. That isn’t the only thing he finds though, VAL-EL IS THERE!!! Except it’s not really him and is a hologram that Val created to guide Seg and save Krypton (and Val seems to like giving history lessons like his buddy Daron-Vex as he gets the low down on House El) It seems that the computer is not the only thing Val created, as he created technology to enter the ‘Inter dimensional realm beyond the Space-Time continuum’ or to us laymen, the Phantom Zone – Yes that Phantom Zone where Kara Zor-El’s pod and Fort Rozz were! Val used it to travel through space and found Brainiac destroying worlds in the process. When he tried to warn the council, he was killed Seg decides to take up the cause, but he has to deal with the whole House of Vex thing first. Back at the duel, Lyta is all bloodied up and still being a fierce warrior landing hits and taking them to take down and kill Quex-Ul, quoting her mothers words from episode 1 back to onlookers ‘We never ask for mercy’, before walking off like a total BAMF leaving her Jayna behind with a proud look on her face. Seg is back at the court room and is waiting for Daron-Vex and Nyssa before telling them that we won’t be a Vex. He said that even with everything that has been offered to him, he will not wear the sigil of the House of Vex and he’d ‘rather die rankless.’ Rao turns up and tells them ‘This is acceptable’ in his creepy AF voice and tells Seg that he will bear the sigil of the science guild instead before asking Seg to leave the room with Daron-Vex stunned. In the Outlands, Kem and Adam find a meteor, but its not a meteor at all! But the camera teases us and cuts back to the Vex’ before we see what it is. Daron and Nyssa are scheming in his office and Lyta has command of her own division as Commander Zod. Kem and Adam bring the item that crashed to Seg as proof of Braniac’s existence. It isn’t a meteor at all and is in fact a homing beacon of sorts for Brainiac who sends them out to any planet he wants to take over. Previous Post The Danvers Sisters are #SisterGoals!